I promised several months worth of empties in the first few days of the new year, and I am back to deliver! In yesterday's post I covered some items I was trying to use up so I could be done with them, as well as a few tried and true favourites. Today, the products I will be writing about were all ones I was excited to try initially. While some will make their way into my shopping cart again, there are a few I was less than pleased with. I was able to recycle 6/10 of these products. When I received this in my The Cruelty Free Beauty Box, I was not impressed by the size and honestly wasn't too interested in trying it straight away. Well, although the sample size was small, the product itself blew me away! 100% natural, 81% organic, vegan, cruelty free, Soil Association certified, and jam packed with antioxidant goodness, this moisturizer is most definitely on my keep list. It has a really lightly fruity scent (not overly sweet, not sickly floral -- seriously perfect! ), and sinks into the skin almost immediately. My face is sensitive to changes, but this was so gentle that I didn't suffer from my usual 'I switched products' breakout. The price tag is the only thing that has made me hold off from buying the full size straight away -- £41.00 for 50ml. Don't get me wrong, the salts themselves were lovely. I'm not sure if I got a bad batch or what, but the flowers in my packet almost seemed like they were half rotten. They were brown and slimy and definitely not something I wanted to bathe in. The smell itself wasn't awfully unpleasant, but I found it a bit sickly sweet. I will stick to the other bath salts I have tried recently (Joik and Isla Apothecary). I am not a new user of the Madara brand thanks to my Love Lula Beauty Box, and so I knew whatever this product was, it would not be disappointing. Since my skin tends to not like heavier creams, my partner actually used this sample up, but from the feel of it on my fingers (yes, I apply his products for him! ), this is a highly moisturizing product. It smells of a generic face cream, but the scent doesn't last for very long. The product sunk into his skin pretty quickly, and his face did seem a bit more radiant afterwards. The problem with sachets is you never really get enough to fully experience the product's long term effects, but from the few uses we got from this, the cream seemed great. Unfortunately, I don't think he will want to spend the money, so will probably not be repurchasing. To be completely honest, I still don't think I fully understand what micellar water does that a toner or floral water doesn't do. But judging by the micellar water by Madara, it is a pretty good all-in-one item for removing makeup and hydrating skin. I have the full size version of this that I received last year in my LL box, so I basically just used the sachet to refill a bit of my bottle. There isn't much of a smell to this item, which I appreciated, and it doesn't leave much of a residue on the face. I found it wasn't effective at taking off eye makeup, but otherwise it got the grime of the day off my skin. I found this micellar water fine, but I think I prefer my regular toner and cleanser so will not be purchasing another. I covered this in my last empties post, and as you can see, it is a regularly used item for me! I love this stuff, and will continue to use and buy the product regularly. Like I mentioned in my post on the PHB facial tonic range, I bought this product not for myself, but for my partner. He has mature/dry skin, so this toner was perfect for him. It has a light slightly citrus scent, and leaves no sticky residue. I think I will actually buy him the full size spray, as he is so fussy and he didn't moan about using this! It took me a while to get around to using this, as I have so many face masks in my cupboard, but when I finally tested it out I was totally sold. It smells gorgeous! The scent, almost like lemon-lime, isn't overpowering, but strong enough to fill the bathroom for a good minute or two. I found it difficult to find the right water to powder ratio, and my mask came out more liquidy than I was expecting each time. Despite that, it didn't dry out my skin like other clay based masks, and it didn't make my face have a massive break out the next day. Once I have used up the rest of my clay masks, I will definitely have a think about buying the full size. I have received this product twice from the Love Lula Beauty Box -- one of the Geranium and Peppermint, and one of the Neroli and Lime. While I haven't gotten around to using the second one yet, this was a pleasant surprise! I am not usually keen on body wash, as my allergies tend to be triggered by strong smells, but this one was gentle and didn't send me into a sneezing fit. It doesn't have a huge amount of lather, but I actually prefer that. I definitely think I will be tempted to buy the full size once my other travel bottle has been used up. So I feel like I sort of cheated on this empty, as it is not actually all used up. I used about half the bottle as it was intended (a face balm), but then decided to experiment a bit and used the rest to make some DIY lip balms! As a face balm, I found it worked okay, but it was stickier than I had been expecting. It was really difficult to warm up easily in the tube, and without warming it up the balm came out fairly solid and grainy. I prefer the texture of the Balm Balm beauty balm over this to be honest. As a lip balm, however, it worked perfectly! I dispensed the balm into little pots, heated it until it was liquid, then added a drop or two of essential oil (I chose lemongrass for one, and tea tree for another) and let the balm cool. The grainyness of the product seems to have completely disappeared, and it is very hydrating on my lips. I might just buy this to make some more lip balms! Ingredients: Butyrospermum parkii (shea butter), Helianthus annuus (sunflower oil), Cera alba (beeswax), Calendula officinalis (calendula oil), Simmondsia chinensis (jojoba oil). I received this in a swap box, so I actually have no idea where I can repurchase, but once I find a stockist, I will be snatching up a few (as long as they sell them in a larger size -- not too keen on the wasteful packaging!). The mask was incredibly tingly on my skin, but not in an unpleasant or painful way. It almost smelled a bit like peppermint, but as you can see in the ingredients, there is no peppermint in it. The mud dried super quickly (less than 5 minutes) which I liked as I am incredibly impatient, and it didn't make too much of a mess in my sink. I would love to try this mask out again. 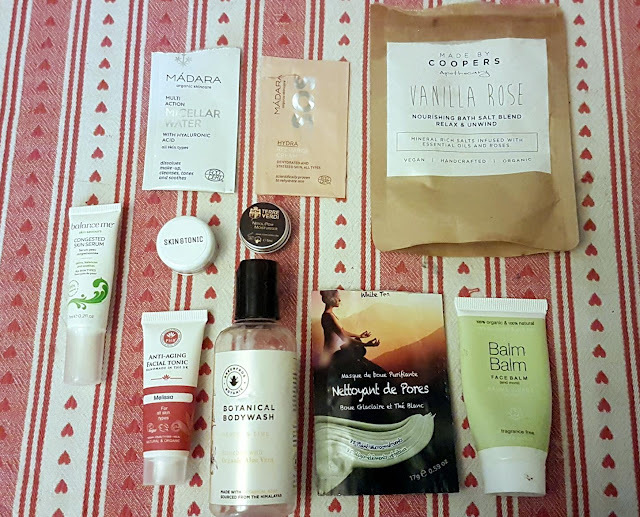 So many empties, impressive ;) I have the Skin and Tonic Coco mask and found it too liquid as well until I read that we can put it with a brush. And I find it so nice to have just a thin layer on the face. I will have a look on Terre verdi, I never heard of them.